I was elected Vice-Chairman in July 2013. I have been on Tribal Council since 1992 in various positions including Vice-Chairman and as a Councilor. I am the Liaison to the Historical Preservation Committee and the Education Committee. I was appointed the Historical Preservation Officer in 2009 by Tribal Council. 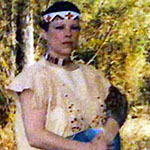 I was appointed by the Tribal Council as the President of the Tribal Wuttooantam Foundation in 2006. I was also elected to various Tribal Committees; such as Election, Infrastructure, Pow-Wow and Youth. I am a 1985 graduate of Norwich Tech and have lived in Ct most of my life. In 1985 I received a Hairdressing degree. I currently work as a Career and Employment Counselor for the Rhode Island Indian Council, a Non-profit WIA program where “natives are working for natives”. My goals are to gain back our acknowledgement and develop a plan for Economic Development so that our Tribe can be self sufficient. In addition, to keeping all family lines of our Tribe UNITED.